Its weird being back. Argh my body is fucked. Jet lag and pms are taking its toll and my skin and hair are a crazy mess. Best news was though that Luke is coming over to visit next week! For 3 weeks! On one hand Luke is one of the nicest people I ever met, and on the other Australia is very far away, and am I ready for and do I deserve nice? I think Im so used to men treating me like crap that when one is actually nice and does the huge romantic gestures I dont know what to do! I spend my life fighting men to be like that for me, and heres one being everything I need him to be, and I dont know how to handle it!! As panicky as I am (and most of it is probably pms) Im looking forward to him coming over, so I can show him europe and my home I described to him and stuff when I was in Australia. Its his first time to this side of the world so it will be fun showing him around. i also have to go visit my sick aunt so good to have support to do that too :) Good to just have someone who really understand near to, as really need support and hugs right now! Still figuring out moving to Perth and selling all my stuff in preparation. 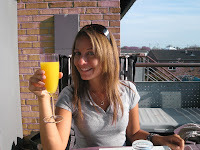 Picture is yesterday on my balcony having dinner with my friend Mie..